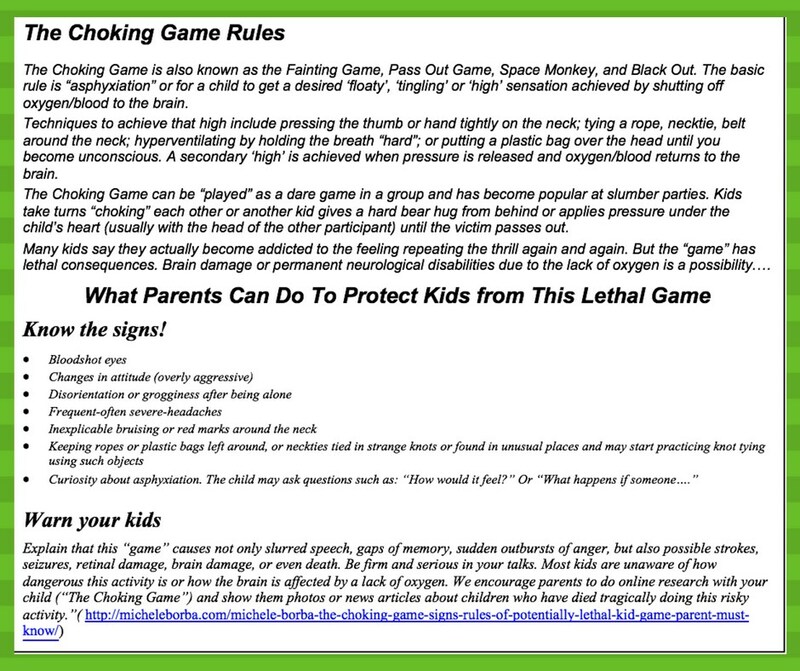 The Choking Game is also known as the Fainting Game, Pass Out Game, Space Monkey, and Black Out. The basic rule is “asphyxiation” or for a child to get a desired ‘floaty’, ‘tingling’ or ‘high’ sensation achieved by shutting off oxygen/blood to the brain. Techniques to achieve that high include pressing the thumb or hand tightly on the neck; tying a rope, necktie, belt around the neck; hyperventilating by holding the breath “hard”; or putting a plastic bag over the head until you become unconscious. A secondary ‘high’ is achieved when pressure is released and oxygen/blood returns to the brain. The Choking Game can be “played” as a dare game in a group and has become popular at slumber parties. Kids take turns “choking” each other or another kid gives a hard bear hug from behind or applies pressure under the child’s heart (usually with the head of the other participant) until the victim passes out. Many kids say they actually become addicted to the feeling repeating the thrill again and again. But the “game” has lethal consequences. Brain damage or permanent neurological disabilities due to the lack of oxygen is a possibility.